I received a copy of this book from the author in exchange for an honest review. All opinions are my own! There are three types of guys: forks, knives, and spoons. Women’s fiction sometimes gets a bad rap. Chick lit is often used in a derogatory way; the books we aren’t supposed to like. I don’t agree with the negative stereotypes associated with it, and if you ever meet me in person I’ll give you my whole diatribe about it. There are poorly-written pieces of literary fiction and great chick lit books. I will read it all! As much as I enjoy a well-placed women’s fiction novel, I hadn’t read one in awhile. 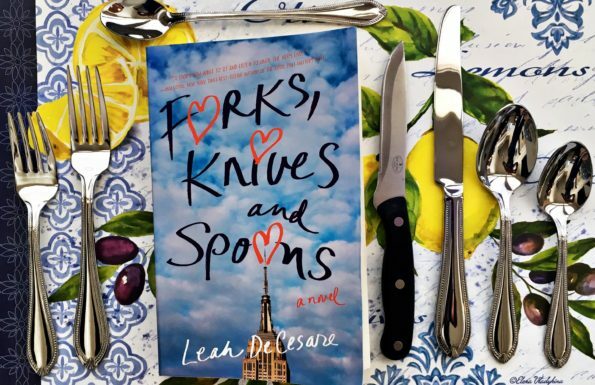 Then Leah DeCesare’s Forks, Knives, and Spoons landed on my nightstand, and I am so glad it did! This is good, fun women’s fiction, and was a surprise hit for me. Amy York is starting her freshman year at Syracuse University in 1988. Her father, concerned about the potential college boys that will cross her path, sends her off with a lecture about how to categorize guys: forks, knives, and spoons. In addition to a degree and career, he wants Amy to find her perfect steak knife. Amy and her roommate Veronica navigate the next four years and beyond together, meeting all categories of boys and men, and finding themselves in the process. Woven into the story are all manner of 80s and 90s references, which, while blatant, are fun. As many people have said, this book is a total nostalgia fest, and it was a lot of fun to re-visit college (in a different decade), but not why I loved Forks, Knives, and Spoons. The initial utensil labeling system (or UCS in the book-Utensil Classification System) is a little silly, but DeCesare uses it as a jumping off point for the rest of the book. It is referenced throughout, but the relationships between Amy and Veronica and the girls and their boyfriends are the main event. There is some mild-mannered romance, of course, but the female relationships are just as important to the story. That being said, I did find myself, surprisingly, drawn into the college romances and drama, as well as the friendships, as if they were my own, and once I got into it I couldn’t put the book down. If you enjoy reading women’s fiction or watching romantic comedies like Love Actually and When Harry Met Sally, I really think you’ll love Forks, Knives, and Spoons . It fits perfectly into that romantic comedy category. The plot is predictable, but that didn’t make it any less enjoyable. This was the perfect book to end summer with, but I think it makes a great fall read too. A blanket, some hot chocolate, and this great escapist book (perhaps paired with watching Love Actually or Legally Blonde) would make for a cozy fall evening. It’s only a matter of time until Reese Witherspoon options the film rights for this one . . .